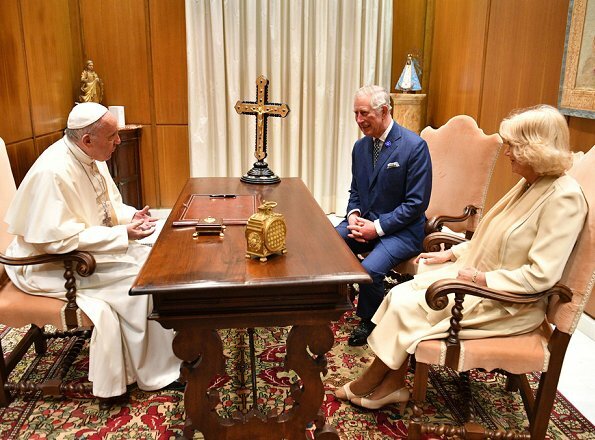 Prince Charles, Prince of Wales and his wife Camilla, Duchess of Cornwall met with Pope Francis at the Apostolic Palace on April 4, 2017 in the Vatican City. The British royals are in Italy for a six-day visit as part of their European tour. I'm just a little bewildered about the Duchess wearing such a creamy colour to this visit, as she is normally not allowed to show up at the Vatican in white or ivory. It depends, I think, on the level of formality of the visit. The last time the Queen (QEII) visited the Pope she wore blue, and I think we can assume she is well aware of the requirements of protocol. 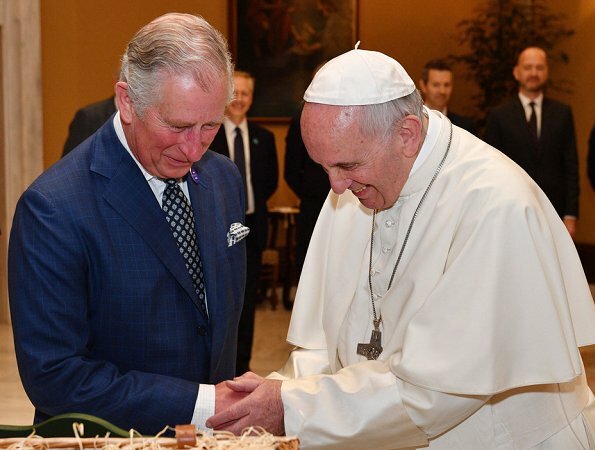 Only a few woman are allowed to meet the Pope in creamy-or white colours. "Le privilege du blanc", google it. Is Camilla a catholic? 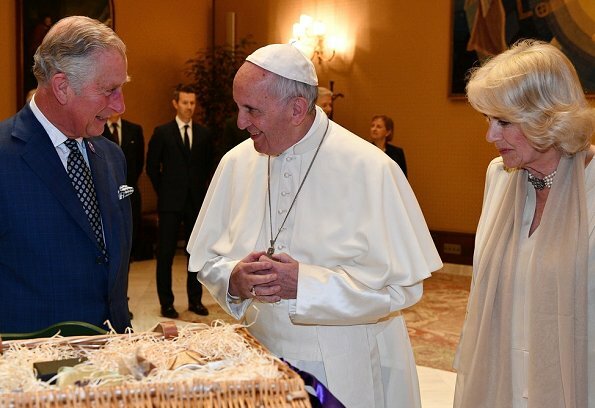 Camilla and Charles catholics? Surely not in the sense of "Do not commit adultery" or "Do not lie" or "Do not hurt innocent naive young womens souls"
I think that Le privilège du blanc does today concern only very formal events like new pope´s inaugural mass etc. This current pope has lowered requirements and women have been using other colors than black recently. I am sure Duchess Camilla knows very well the current etiquette. 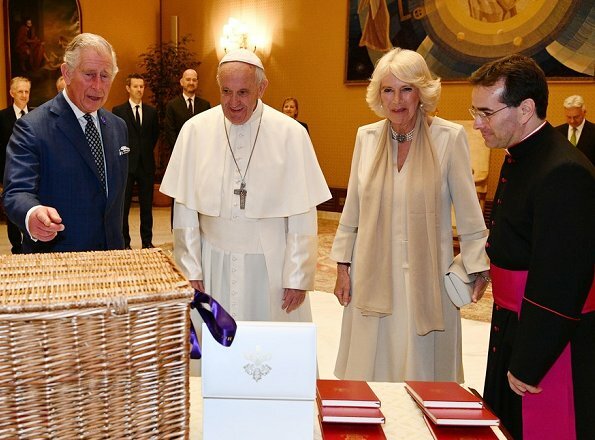 Camilla is not catholic. Also that Le privilege du blanc does not let any catholic queen to wear white, only certain catholic state´s queens. Those are queens of Italy, Spain and Belgium, Grand Duchess of Luxembourg, princesses of the House of Savoy. All other queens and princesses have to wear black even if they are catholic (like queen Maxima). Blondiini in italy there is not any monarchy. Get informed. There is no doubt "rules"were made a very long time ago, but if you use a present verb ("those are") i think you should not mention Italy among monarchies. People everywhere enjoy this blog. Thank Ms. Electra for bringing us together through her passion for royal fashion! Let us not forget that many of us enjoying this blog speak languages other than English. I questioned the light dress and it's v-cut, although it's tasteful. Let's not chastise one another for it ruins the spirit of this beautiful blog. She can wear any colour she likes! Barbara, not any one is allowed to wear that colours at a vatican-visit. Anyway... It is interesting who and why one belongs to that circle. Thought the etiquette was white for Queens and Princesses from RC countries and black for non conforming countries ? The pope has relaxed the rules. On very formal occasions the rules still apply but not for informal meetings. The Queen wore blue when she saw him recently. Well, well, well, the picture says so much more. Who is in the know? Qu'y a t'il dans le panier ? De bonnes chose à manger de là Prince ´s Trust ? Actually the dress/coat are a gold color. The Vatican itself released a statement saying "there are no hard and fast rules" and it is not required. She did wear black and a veil in 2009. Not required now. Especially from a non RC. Did Camilla has the previlege du blanc??? I too thought it was interesting that Camilla was not wearing black. 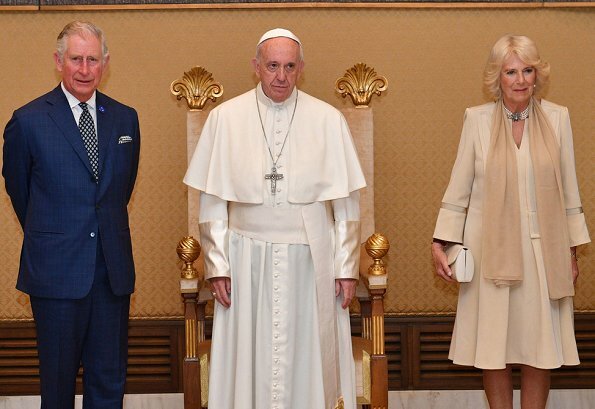 I know this Pope is far more "relaxed and informal" than previous Popes, however I was still surprised to see Camilla in a light colour and without a veil. The Queen can wear what she likes as she is head of the Church of England, so she is the Popes equal as such. I don't know if Camilla is still Catholic, but when she was when younger, she was also married in a Catholic Church when she married Andrew Parker-Bowles (I think his name is Andrew), anyway, being Catholic was one of the reason why Camilla was deemed "unsuitable" as a bride for Charles - mind you I am not an expert, I am only going on what I have read (in books) and heard by supposed Royal experts on TV. "It's me": that's what I meant about "catholic". Nevertheless, her outfit is good on her, but as always (whatever she wears...), she needs a much better fitting bra!